Makeup artistry is kind of an odd profession, if you think about it: with the exception of people who work at the makeup counter or who have corporate jobs, very few MUAs have set schedules, and like a lot of artists, many of them are constantly looking for work. That task—finding new work, week after week—can be daunting at first, until you get asked to be a part of an agency, or have so many professional contacts the putting together jobs is no longer your first concern, and you're working the glamorous fashion gigs you've always dreamed of. But what about if you're not there yet? Where do you go to find makeup artist jobs? We recently wrote a long post about the sites on which you need to have a profile, but here are a few sites where you can actually go out and find work, instead of waiting for it to come to you. 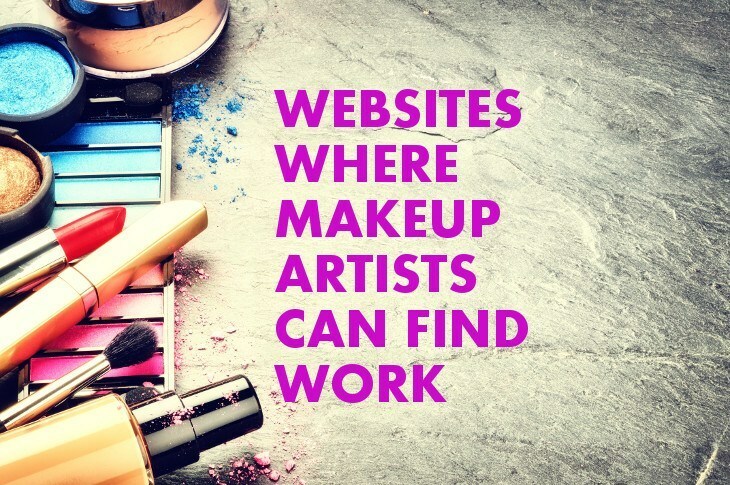 These are sites where people post that they NEED a makeup artist—rather than sites where makeup artists need to advertise themselves. The sites below are a mix of full-time job opportunities and one-time gigs. If you're looking for full-time work, the sites below will probably be very helpful. If you're looking for individual, one-time gigs, you might have to sift through a lot of the results to find the jobs you're looking for. Another note: If you're a bridal makeup artist, the sites below probably won't be too useful. Most brides don't post gigs online—instead, they usually do the research and reach out to local makeup artists themselves. So it can be difficult to proactively find weddings gigs. You can look on TheKnot.com, WeddingWire.com, MyWedding.com, and Craigslist.com, but for wedding MUAs, you best tool for finding work is having an excellent website and maintaining your online profiles. This site has a surprisingly good number of jobs, and you can sort the results by how far away from you they are, when they were posted, and, if you click "More Filters" on the left-hand side of the page, by title, education required, and so on. There are a lot of full-time positions available, and there are some big-name companies that are listed (such as Lord & Taylor and Estee Lauder). Indeed.com has fewer job openings for makeup artists—there were 64 in the NYC area when we looked—but they tend to be more "on the mark" than SimplyHired.com, which returned more than 1,000 search results, but most of them had nothing to do with makeup. Indeed also lists the salaries offered for each job, which is a nice little perk that some other sites don't offer. This is primarily a "corporate America" job site, but it's SUPER popular—there are literally millions of people on the site—and it's known as the "Facebook of business." Similar to Indeed.com, there are fewer jobs posted here, but the jobs are of a higher quality. These are mostly full-time makeup jobs, so if you're looking for one-off gigs, it might not be too helpful. If you get the chance, make a resume and post it on the site. Business people do a LOT of presentations, and it's becoming very common for them to require makeup artists. Think about it: if you're a CEO and you're hosting a presentation the will be live-streamed to thousands of employees all over the globe, you're going to want to look your best. If that CEO is on LinkedIn all the time, it can't hurt if your resume is on there! Monster.com is similar to Indeed. They have a couple dozen job listings. Not a fantastic jobs site, but something to definitely look at. We've never used the two sites below, but they came suggested by a friend: www.MakeupArtistJobs.com (and their Facebook page, here) and www.GetMakeUpArtistJobs.com. We've never used these two, but you can give them a try and see if they're helpful. It looks like you sign up and they send you job postings every week. As always, there's Craig's List. It's not glamorous, but a TON of people look to Craig's List for MUAs near them. Not only can you list your services on the site, but you can also navigate to the city nearest you and search for "makeup jobs." Again, not all of the results will be relevant, but you'll probably find a couple of decent job prospects there. This section was really boring to write, so it'll probably be boring for you to read, but it might be very helpful. On all these sites, you're using the site's search engine to display search results for you. The search engine on these sites isn't always that great, so you'll probably get a LOT of search results that aren't relevant to your job search (for instance, when we ran a search for "makeup artist" on SimplyHired.com, we got three job postings to be babysitters in a bowling alley. Ummmm... no). …WITH a space between "make" and "up". The two different searches may give you very different search results, and if you're not careful, you could miss out on a job that would be perfect for you. So, So Sorry To Have To Mention This Again, But, "Networking"
Oh my goodness, we're like broken records. If you've read a few of our other posts, you've probably realized that we are almost constantly saying "You can do it" and "Don't forget to get experience by working at makeup counters" and "Use the power of your network." We're sorry we repeat those things so much! Because we absolutely do. Enough already. Ok, we'll mention it just once more: your professional network is super, super, super important. Over the course of your career, you will get so much work from people who recommend you and refer you to others... it really is incredible. So, we're talking about finding jobs, we thought we'd mention NETWORKING. Read our post on networking. Remember, the amount of work you'll be able to find near you relies heavily on how many people live in your area. If you live near a city, you’ll have a lot of job options. If you're from a small town hundreds of miles from the nearest metropolitan center, there may not be too many jobs listed. Also, you may find that you find the same jobs listed on each of these websites. That's normal, and that's the case for most jobs. And, finally, remember that there will be busy times, and there will be not-so-busy times! Keep hustling, and your career will move forward. What Does A Makeup Artist Assistant Do, And How Do I Become One? What Will I Learn in Makeup Artist School? How Hard Is It REALLY To Become a MUA? What is a MUA Career Actually Like? Where Do Makeup Artists Work? Why Should I Become A Makeup Artist? Welcome to Makeup Artist Essentials (www.MakeupArtistEssentials.com). We are a participant in the Amazon Services LLC Associates Program, an affiliate advertising program designed to provide a means for us to earn fees by linking to Amazon.com and affiliated sites. Amazon and the Amazon logo are trademarks of Amazon.com, Inc. or its affiliates.